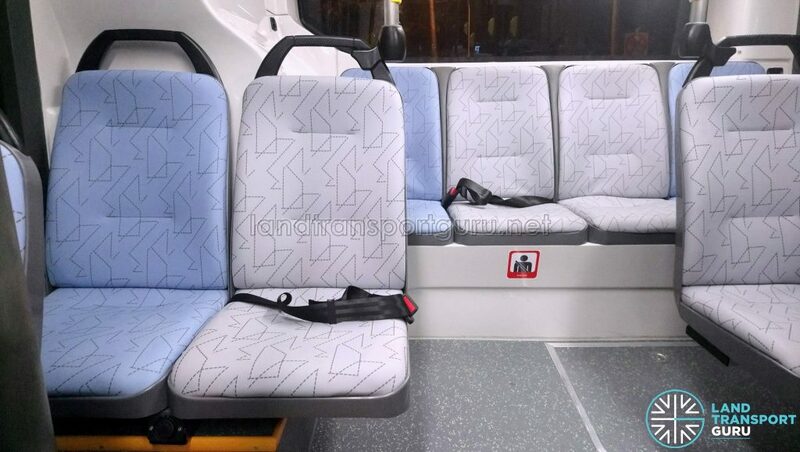 Several modifications have been made to the interior of Euro 6 MAN A22 (NL323F) buses since the delivery of the first batch. Earlier buses featured more crude design elements which were slightly finetuned on subsequent buses. 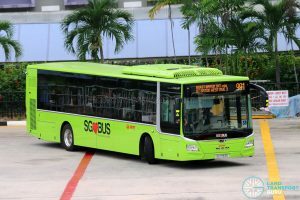 As part of the Bus Contracting Model, the Land Transport Authority (LTA) had initiated further purchases of MAN NL323F (or MAN A22) as well as MAN A95 buses under Contract PT337 – Procurement of 250 MAN Buses. 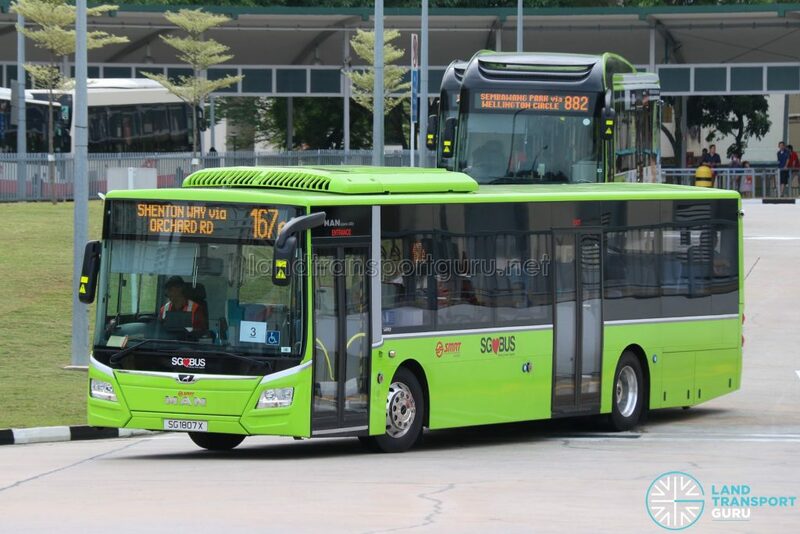 These are the fourth batch of MAN A22 buses to be built for the Singapore market and were procured under a negotiated contract, as opposed to an open tendering process. These buses are Euro-VI compliant and are bodied by Gemilang Coachworks with the MAN Lion’s City bodywork. 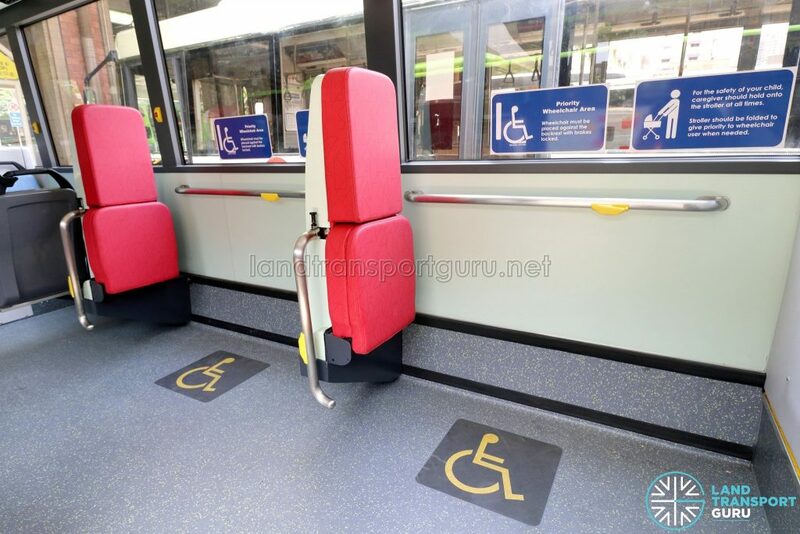 Also in compliance with new LTA specifications, buses are equipped with a suite of new features, such as Passenger Information Display Systems (PIDS) and two wheelchair bays. 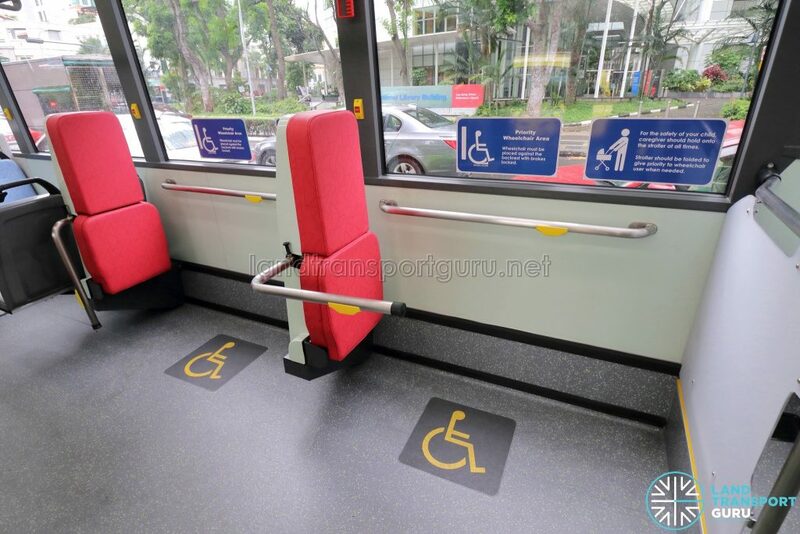 A new feature required on new buses is the aisle-facing foldable handlebar at each wheelchair bay, for the benefit of wheelchair-bound passengers. 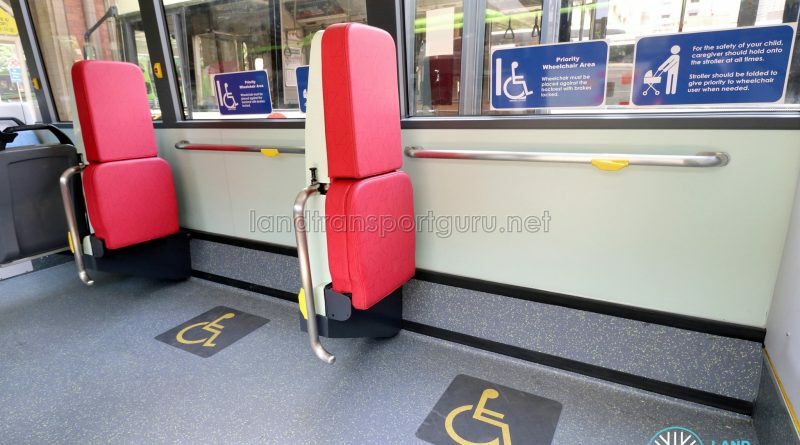 It contains a wheelchair stop request button and can be manually deployed and stowed depending on the needs of the passenger. Earlier buses featured a straight handlebar with a crude rubber stopper at the end (Left). Later-delivered buses would feature a more aesthetically-pleasing curved handlebar design that is sealed at the end (Right). The handlebar position is changed manually by releasing the indexing plunger, and then pulling/pushing and rotating the handlebar into its desired position before locking it in place. Handlebars on later-delivered buses have a more sturdy design with more friction within the moving mechanism. 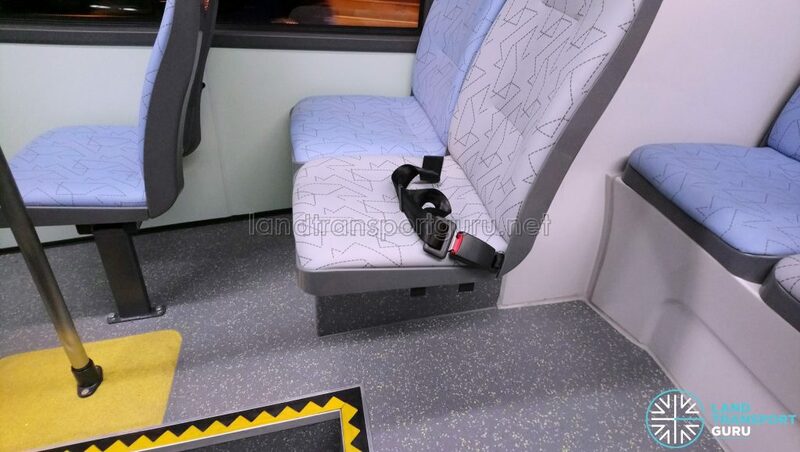 The wheelchair backrest has undergone several changes to conceal electrical wiring linking the wheelchair stop request bell with the rest of the bus’ electronics. In the earliest design (#1), electrical wiring can be seen in two locations. 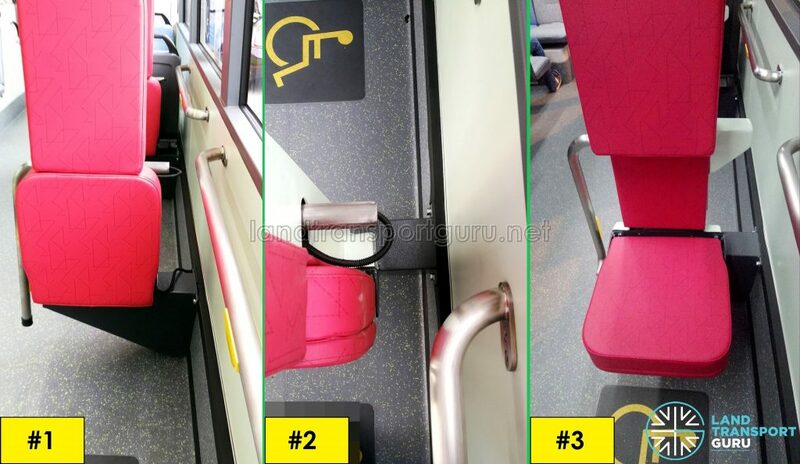 In the next iteration (#2), the lower cable has been concealed within the metal mounting bracket that connects the wheelchair backrest to the sidewall of the bus. Finally, in the latest design (#3), a trapezoid-shaped plastic cover conceals the protruding metal bar and electrical wiring. Newer MAN A22 buses have an additional seatbelt installed on the second rearmost row of seats. 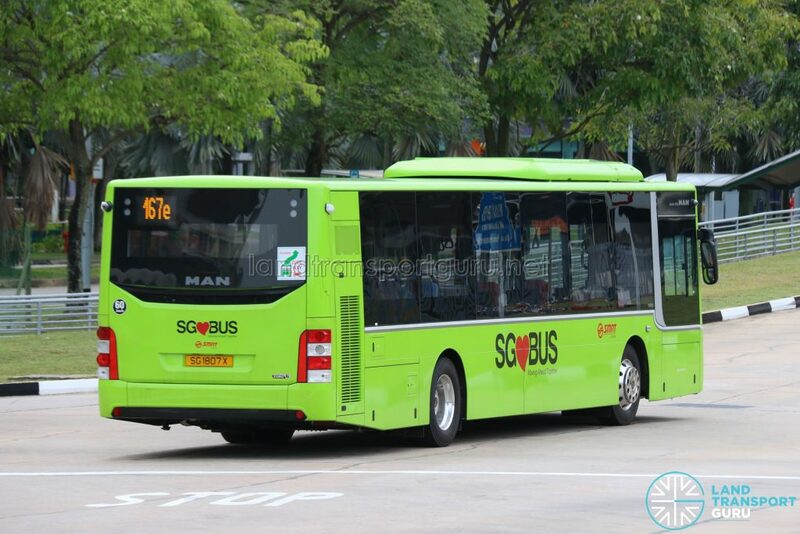 MAN A22 Euro 6 buses registered from SG1804D onward have a larger front and rear Electronic Display Signage (EDS).